Chris Hughton wants Brighton to be more productive in the final third after Yves Bissouma's superb late free kick earned a 1-1 draw at Birmingham this afternoon. The Seagulls struggled to get going against their Championship hosts for long periods of the first half but were much better in the second half and went close to equalising on a couple of occasions, before Bissouma rifled home a free kick in the final minute. Maikel Kieftenbeld's 25-yard volley gave Birmingham the lead at half-time and Hughton said afterwards: "I thought we were a bit slow to get going. We came up against a team who are very well organised and they've had a good pre-season and that probably showed. "We found it difficult to break them down and they're very good on the counter-attack. "By the time we got towards the last periods of the game, I think we very much deserved to get something from it but it's another really good test for us." 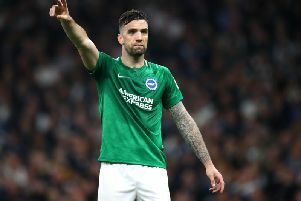 The final third is the area which Hughton feels Albion have to be better in and added: "Always the most important thing is fitness and the sharpness you hope you'll have come the end of pre-season. "The areas we need to be more productive in are the final third. We were up against a team today who were very well organised and looked a good side. But we had difficulty breaking them down. "We've had good periods in most of the (pre-season) games in that final third but it's about that ability to have an end product or to break teams down. "That's the most important area for us." Hughton feels Bissouma will be a good acquisition for Albion after Seagulls fans saw him for the first time today and said: "It was a fabulous goal. He's a different type of midfield player to what we already have. He's one who wants to break forward and that's what we wanted. "We want different types of midfield players who do different roles. He's young, he's still got a lot of learning to do and he's still got to get used to the system here but we hope he's a very good acquisition for us."